I had to re-examine why I was stuck on weight loss, and it was because I slowly started to increase some things into salads, which were not conducive to weight loss. Yes, you are supposed to have proteins six times a day, but if you eat half of a cup of regular cheese and not lite, then you are adding more fat into your diet. Technically, there are no carbs, but you still have to watch portion size. You are better off with lite cheese, but if you do regular cheese, you have to use less and less often. I know that was a problem for me and I will be watching this from now on. 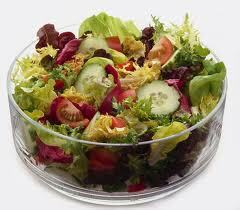 So, here is a list of items that are basically No-Nos for a salad while trying to get or stay skinny. 1. Regular fat cheese (already covered that). 2. Candied nuts. You already have to watch the amount of nuts you eat in a day because they have carbs, but the added sugar in candied nuts is over the top. 3. Croutons. Very high in carbs and they have no nutritional value. They are made from stripped white bread. If you must have bread, have a wheat roll or slice (I don’t recommend eating bread while trying to lose weight, but you can eat a wheat roll or slice once or twice a week instead of having fruit. 4. Won ton noodles or tortilla strips or chips. Same as croutons. Basically, one tortilla chip has about 1g of carb per chip. Are you willing to sacrifice for that? Have a serving of carrot in your salad instead. 5. Sun-dried tomatoes. Too much sodium. Get fresh tomatoes. 6. Watch the salad dressing. Some are filled with carbs. Get a good balsamic vinaigrette or lite ranch. Don’t forget that you can add a protein into your salad like egg, chicken, turkey, etc. and make it tasty.